On December 2, National Samba Day celebrates one of most significant musical rhythms for Brazilian culture and is commemorated with public shows of famous musicians in the historical center of Salvador. The National Day of Samba came about as the initiative of one councilman from Bahia, Luis Monteiro da Costa, to pay tribute to the Brazilian composer Ary Barroso. Barroso had already composed his first hit called Na Baixa do Sapateiro, an ode to the city of Salvador even though he had never set foot in Bahia at the time. December 2nd was the date he visited Salvador for the first time and the party was spread throughout Brazil and became a national samba celebration. Brazilian Popular Music – also known by its acronym MBP, has several musical genres, like marcha, canção, baião, xaxado, embolada, frevo, etc…The most remarkable, although, and which became the mark for singing and dancing in Brazil is the Samba. Samba resulted from the first African samba de rodas in Bahia in the end of 16th century and the beginning of 17th and was later combined with lundu, polka, habanera, tango, and maxixe. Furthermore, throughout centuries, Afro-Brazilians in Bahia would have dancing parties that were also called samba. From 1538 to 1888, enslaved Africans came from different nations and tribes, in which cultures were different one from each other. Therefore, their various habits and customs had influence in Brazilian art and culture becoming part of the Brazilian Popular Music and Carnaval. Bahia’s “old aunties” (such as Tia Ciata), who moved to Rio de Janeiro, planted the seed of the samba in the neighborhoods near the center of the city. Moreover, in the 20th century, by mixing profane and religious festivals with song and dance for both pleasure and for faith, the “aunties” started the development of samba players who grew in number and popularity through the 1920’s and beyond. Ilê Aiyê, the first afro-bloco of Brazil, was started in Curuzu, Liberdade, which with about 600,000 inhabitants is one of the most populous black neighborhoods in the country. The group was founded on November 1, 1974 to preserve, enhance, and expand exposure of the African-Brazilian culture in Brazil and has pursued this goal in different ways. Throughout its history, Ilê Aiyê has been honoring African countries and Afro-Brazilian uprisings which has contributed strongly to the process of ethnic identity and the cultural self-esteem of black people. With its 3,000 members, Ilê Aiyê today is the heritage of Bahian culture, a milestone in the process of re-Africanization of the Bahia Carnival. 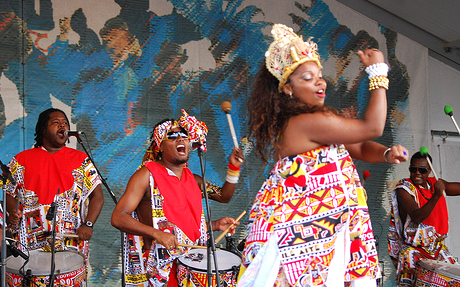 The musical rhythmic movement, invented in the 70s by Ilê Aiyê, was responsible for the revolution of the Bahian carnival which continues to develop and represent new rhythms derived from African traditions. To promote political and educational consciousness, Ilê Aiyê does so through thematic selection of dance, gestures, language codes that transmits the African ancestry of the past with the historical and social context of blacks enslaved in Brazil, and then with the everyday Afro-Bahian of today, in addition to working in the pan-African universality of the Afro-descendant. Ilê Aiyê also expresses the evolution of black/African renaissance and African American movements (adapted to the Bahian reality) focusing on the relationship and identification between black people from anywhere in the world, always emphasizing their common ancestral origin. The video below brings together 40 years of carnival images of Queens of Ilê who represent the celebration of black beauty.